Hormone receptor (HR) status is an important prognostic factor for patients with metastatic breast cancer (MBC) and is also correlated with other prognostic factors, such as initial lymph node status, HER2-Neu status and age. The prognostic value of these other factors, however, is unknown when stratified by HR positive versus HR negative patients. The aim of this study was to evaluate prognostic factors for MBC survival in relation to HR status. 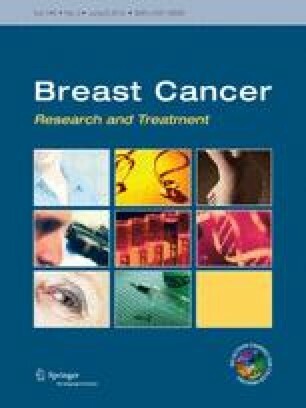 Dutch women diagnosed with breast cancer in 2003–2006 treated with curative intent who developed MBC within 5 years of follow-up were selected from the Netherlands cancer registry (N = 2,001). Independent prognostic factors for survival after metastatic occurrence were determined by multivariable Cox survival analyses stratified by HR status. Interactions between HR status and prognostic factors were determined. Median survival for MBC patients with HR negative (HR−) tumours was 8 months, compared to 19 months for HR positive (HR+) patients. The prognostic value of lymph node status, HER2-Neu status, adjuvant endocrine treatment and first-line palliative chemotherapy was dependent on HR status. Initial lymph node status was independently associated with survival in HR− patients, but not in HR+ patients. HER2-Neu positive status was associated with better survival in both HR+ and HR− patients, although the association was stronger in HR− patients. Similarly, patients treated with first-line palliative chemotherapy fared better, especially HR− patients. HR+ patients had worse survival if they had received adjuvant endocrine treatment. This study shows that the prognostic value of various factors depends on HR status in MBC. This information may help physicians to determine individual prognostic profiles and therapeutic strategies for MBC patients. We would like to thank the registrars of the Netherlands Cancer Registry for their effort in data gathering.